I installed this update on my Surface Pro tablet just fine, but it will not install on my desktop computer. But there is no such command for DISM. When I type it in I get an error and it tells me to type DISM /? to get a list of available instructions ( or something like that ) and in the list it gives there is no such instruction / command as Cleanup-image. Windows 8.1 Update continues Microsoft’s refinement of its current version of Windows, presenting even greater accessibility to functionality such as Power and Search once hidden in hot corners and menus. Other noticeable changes include title bars, minimize and close buttons now available in modern apps. Another great feature includes the ability to pin your favourite modern apps to the Windows Taskbar. 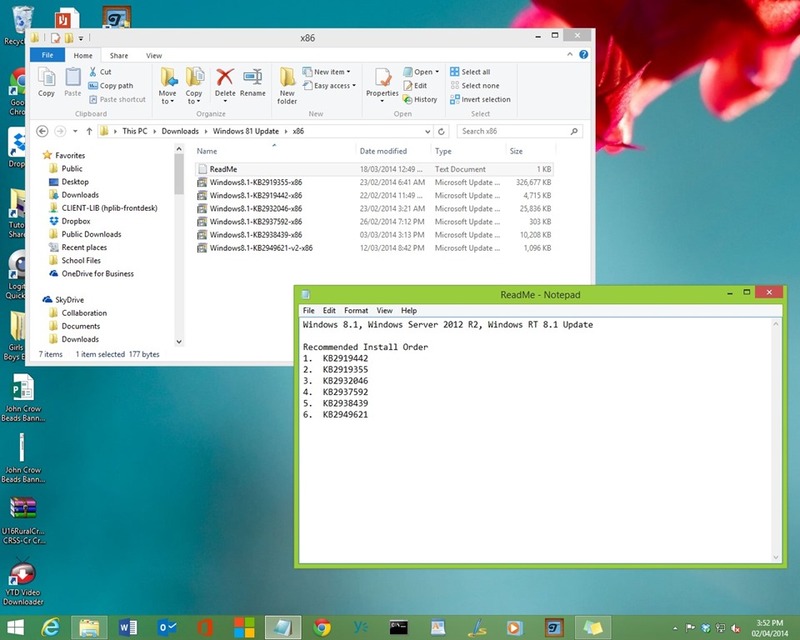 Lets take a quick look at getting it up and running on a Windows 8.1 install. Just as a precaution, you should backup your computer. Please note, this is standalone Windows Update installers I am using which requires installation in a specific order. On April 8th, Windows Update will take care of this, but for this article sake, I will describe the experience. Depended on your system, Windows 8.1 Update 1 is provided as 6 updates, in my case, I only needed to apply 5, since KB2919442 was already installed. The biggest one of them all is KB2919355, which took quite a while to install. In fact, I did this on my work computer around 3:30 PM and I leave work at 4:30, KB2919355 took about 30 minutes be completed and required a reboot. I recommend you do this at a convenient time. The other updates like KB2932046 called Feature Updates, took less time, but each required a reboot. I stopped after the 3rd and finished up the next day, this means, you don't have install all of them right away. After KB2919355, the unique features started to show up, such as Power and Search options appearing on the Start Screen. I understand that boot to desktop is automatically enabled on mouse and keyboard only systems. I already had this enabled. 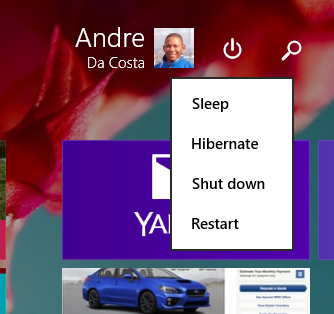 The other feature updates completed quickly and I was ready to utilize the improvements in Windows 8.1. Thanks for the response and the links to the files to download. I downloaded them but the 355 file will not install. 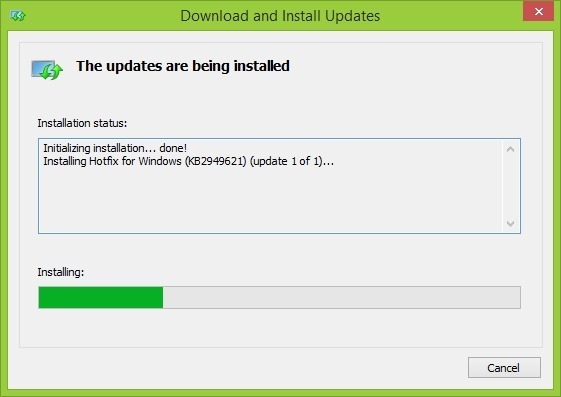 It says it is installing and after a long time the green progress bar goes all the way across so it looks like it is completely installed but then a message pops up that says the update WAS NOT installed. The first time I rebooted after trying to install it, it sat there for over an hour saying it would shut down after the operations were completed but it never does shut down. So I hit the reset button and forced a restart and it did boot up but just into Windows 8.1 not 8.1B. No power button or search icon on the metro page. I just tried to install the 355 file again and got the same results where it says it did not install but I have not tried to restart it again yet. I ran System File Checker and it found no problems. I did a boot time virus scan with my AVAST Premium and it found no problem. I tried the instructions to type in the command prompt some stuff about DISM.exe and it said the file was repairable and the operations completed satisfactorily but when i went to the next step it said it couldn't find the file!! This was a real surprise to me because my Surface Pro tablet took the update to 8.1B with no problem and the desktop computer seems to run just fine ... but it will not accept the update. PS. I just tried to uninstall the KB2919442 UPDATE and it would not uninstall. When I click on it I do not get the menu popup to uninstall like I do if I click on one of the other updates. I suspect the 442 update was somehow corrupted and that is preventing this update to 8.1B from working ... but I can't uninstall it ... big problem. I have discovered that on my computer the previous update KB2919442 appears to be defective. It is one of the updates listed in the package of links the previous responder sent but when I try to uninstall it, it will not uninstall even though it says it was installed successfully. I hope your problem is easier to solve. KB2919442 cannot be uninstalled, so it won't work. In fact, same problem here, all previous updates are installed, dism and sfc /scannow passed without issue, antivirus/firewall disabled, but kb2919355 won't install. What about an upgrade with a "Windows 8.1 with update" ISO? And how to get them (via microsoft if possible, don't like torrent sites) if we don't have MSDN subscription? Update For Microsoft Windows ( KB2919442 ) is required by your computer and cannot be uninstalled. Also, if I go into the Metro UI and open Settings / Change PC Settings / Update and Recovery / Review Update History ... the 2919442 update is NOT shown. 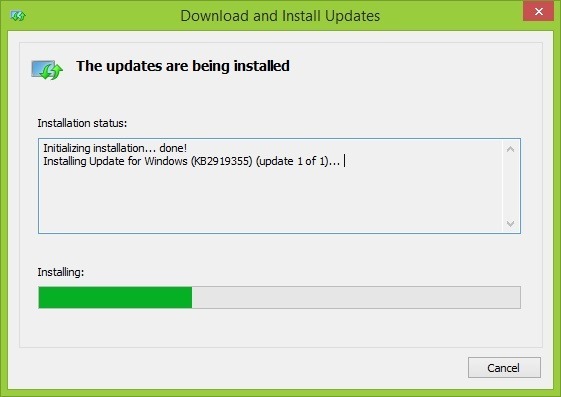 But, from Control Panel / Windows Updates / installed updates it says the KB2919442 update WAS successfully installed. Also, if I go into Control Panel / Programs and Features it shows Microsoft OneDrive WAS installed on 4/4/2014 but it shows Skydrive on both the Desktop and Metro UI. My computer is hosed ( somewhat ) ... still running ... I'm typing on the desktop computer now. I suspect I need someone at Microsoft to work on this but I don't know the phone number to get an actual human being to talk to you. I am experiencing the same issue. I have tried every Windows Update repair possible. I have had no luck. When I do DISM /online /Cleanup-Image /RestoreHealth it tells me either the source failed or the component is not repairable. I have tried the KB2919355 update from Windows Update, from MSDN, and from direct links from several different posts and articles. I would reset my PC and restart but my laptop is a member PC in a corporate domain and the IT offices are not near me. I cannot reset and drop the domain without losing several key domain specific functions that are critical to my job. I tried uninstalling the first update as well but it isn't uninstallable. OK , got a bit more info. Not good news though eventually it may be. I found this Microsoft web page where you can get in touch with an actual live person, although they are in India from the use of English and pronunciations. Click on Technical Support and you can get a Live Chat or have them call you ( which is what I did ). Got a woman named Kenneth ( yeah LMAO ) but anyway she tried hard for a couple of hours and finally she sent it up to Level 2 because she could not fix it. The good thing about this is that the failed update has not stopped this computer from working. So now they are supposed to call me at 9am tomorrow with Level 2 support. Another Microsoft shambles. I spend more time on updating and repairing my laptop than I do crunching numbers with it. Have been down this road before with another 'big' update in the past; that one turned out to be unnecessary!!! I guess this time it is different. I await the result of your call back with great interest.